Erwin Vermassen, Senior Project Manager, Connected and Automated Driving, ERTICO – ITS Europe and Maria Gkemou, Senior Researcher at CERTH/HIT, discuss the SAFE STRIP project, which, to increase road safety, is focused on the latest developments in sensor and data communication technology. Thanks to the huge advances made in telecommunication technology and the ongoing miniaturisation of sensors and computing components, today’s cities are becoming ‘smart’ at an unstoppable pace. Air quality sensors continually, and in real time, monitor the air citizens breathe, whilst parking spaces are individually scanned to determine whether they are in use. The data collected feeds innovative services and allows researchers and public authorities to adjust and steer their policies. Intelligent transport systems (ITS) provide a major contribution to this vision of smart cities. Enhanced, real-time traffic information received by means of infrastructure-to-vehicle and vehicle-to-vehicle communication or generated by remote service providers, updates drivers about the potential problems they might encounter during their journey. Green Light Optimal Speed Advice (GLOSA) improves the traffic flow in the inner city, while multimodal journey planners and real-time information help commuters avoid congestion – a frequent struggle that currently causes delays for commuters. In many ways, the Internet of Things (IoT) revolution greatly changes the way citizens move around a city. 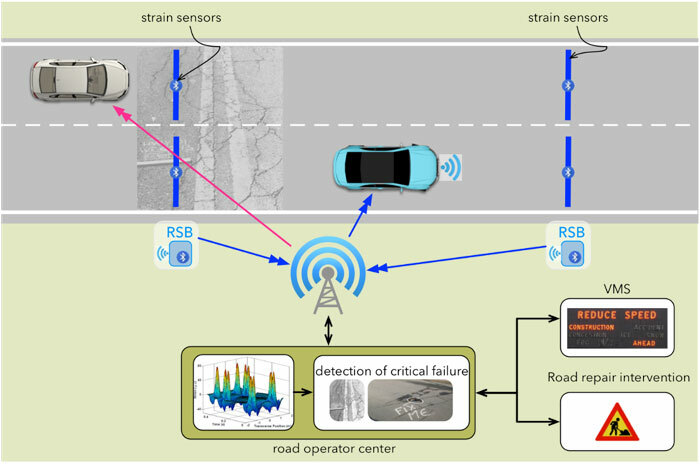 The H2020-funded SAFE STRIP project capitalises on this revolution through the introduction of micro and nano sensors, integrated into marker/tape strips that are mounted on the road surface, adding a copious amount of measured real-time data to the information already available to the road user. The measured data includes – but is not restricted to – road pavement conditions, environmental temperatures and luminosity, detection of oil spillages, vehicle detection, existence of road works, unprotected railway crossings, virtual toll stations and critical traffic incidents. 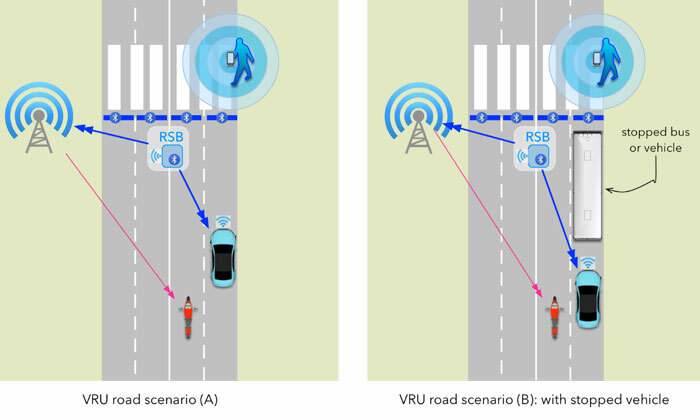 The idea of SAFE STRIP is to connect these sensors both directly with the vehicles, for vehicles equipped with the correct transceivers, and via a legacy network such as 4G for the vehicles which do not have the equipment installed. The project aims to provide solutions for some challenging issues such as integrating very small sensors, and processing units and energy harvesters into road markers and tapes with a height still acceptable on European roads. Another major issue is obtaining the necessary energy to feed the sensor electronics and data communication components. Energy harvesting is therefore one of the major issues to be considered by the project. Finally, getting the data to the consumer is another impressive challenge. The data communication technology used must be extremely low power but able to communicate with running vehicles and a roadside relay unit. The project is executed by a selection of important stakeholders in the field of automotive road infrastructure and C-ITS. Partners include OEMs, PIAGGIO, CRF and research organisations such as CERTH, Fraunhofer, CEA, Cidaut, the National Research Council of Italy, ICCS, the University of Patras and The Computer Technology Institute (CTI). The project is further executed by first tier providers Valeo and Continental, while the strip technology is developed by Swarco. The results of the project are to be demonstrated by two highway operators, A22 Autostrade del Brennero Spa in Italy and Attikes Diodromes in Greece, having previously been technically validated on field in test tracks of CRF and CIDAUT. Finally, the Italian company RE:Lab, in collaboration with CERTH and FhG, researches and develops the HMI strategy and specific user interfaces for the vehicle. The final goal of the project is to improve the safety on European roads with easy to install, cheap marker strips which are, once worn out, easy to remove, whilst replacing infrastructure elements (VMS, toll stations, current surveillance systems) which are costly to install, maintain and operate. The electronics are integrated into the marker strips and made available as a single product. The combination of encapsulation and electronics is referred to as the on road unit (ORU). This scenario allows the road operator to initiate preventative maintenance to the road instead of waiting until potholes, or other faults, become dangerous. By means of miniaturised strain gauges built into the strips, the movements and deformation of the road can be measured, and necessary actions taken, before potholes appear. The use of temperature sensors can detect icy conditions, while gas detection sensors can flag spilled oil and other slippery fluids. Too many accidents happen due to trespassing on railway level crossings and they continue to happen even with the presence of a barrier. SAFE STRIP road markers can identify a vehicle nearing a level crossing and warn the driver. 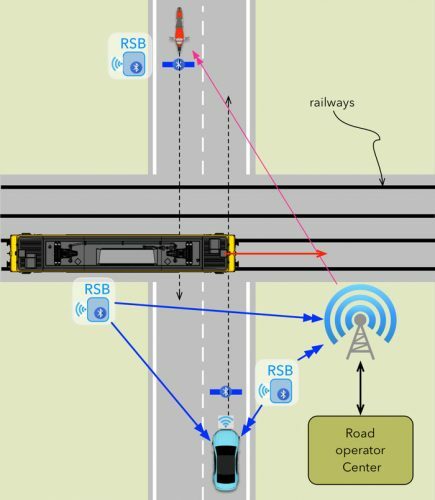 Recently, in collaboration with the SAFER-LC project, a project which focuses on the safety of level crossing infrastructure, it is possible to warn about an oncoming train. The SAFER-LC project is managed by the International Union of Railways. 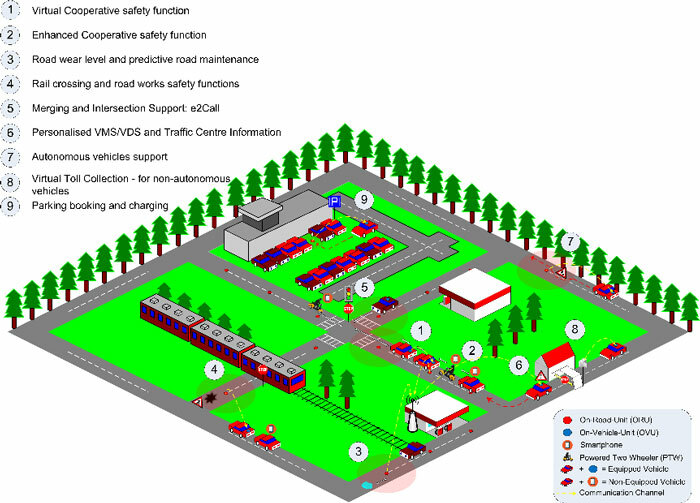 These are only a few of the use cases envisioned by the SAFE STRIP project, others include lane level identification to support autonomy, tracking of weather conditions, personalised VMS information and more. The project envisions first phase services, which use traditional service provisioning via 4G, to be developed and supported through direct communication with the vehicle over a Bluetooth low energy (BLE) communication channel. The services, whether they are provided by infrastructure-to-vehicle or a legacy 4G network are still personalised and related to the close environment in which the vehicle drives. SAFE STRIP builds on top of the latest developments in sensor and data communication technology. The data provided by the sensors enhances the C-ITS by implementing the same ITS-G5 message standards and therefore integrates well in the European efforts to realize a standardised C-ITS architecture. In the past, SAFE STRIP organised cross project clustering meetings with the already mentioned SAFER-LC project and the SAFE-10-T initiative managed by Ireland based Gaven & Doherty GEOSOLUTIONS. The SAFE STRIP project is managed by ERTICO-ITS Europe with the technical lead taken by the Hellenic Institute of Transport of CERTH. The project started in May 2017 and will run until 2020. SAFE STRIP is supported by the European Commission INEA department in the H2020 framework programme.